Meta-analysis allows researchers to combine results of several studies into a unified analysis that provides an overall estimate of the effect of interest and to quantify the uncertainty of that estimate. Stata has some of the best statistical tools available for doing meta-analysis. The unusual thing about these tools is that none of them are part of official Stata. They are all created by and documented by experts in the broader research community who also happen to be proficient Stata developers. 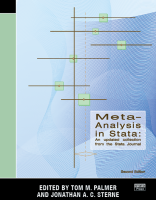 Editors Tom Palmer and Jonathan Sterne show how each of the articles in this collection relates to others and how each fits in the overall literature of meta-analysis. For the first edition, Sterne convinced over half the authors to update their software and articles for the collection. In this new edition, Palmer and Sterne have substantially expanded the scope of the collection to cover in more depth many contemporary advances that will help keep the reader up to date. The second edition retains its original topic-specific sections devoted to the fundamentals of meta-analysis: fitting models, meta-regression, and graphical and analytic tools for detecting bias. It also retains a section devoted to advanced methods. Readers of the first edition will find new articles in these sections, in particular ones that take advantage of major changes that occurred in Stata since the first edition, such as the introduction of the gsem command. This edition also adds three new topic-specific sections for multivariate or multiple outcomes meta-analysis, individual participant data (IPD) meta-analysis, and network meta-analysis. The addition of these sections gives readers access to new commands that address recent methodological developments in the field. The new edition adds 11 articles to the original collection of 16 articles. The articles cover topics ranging from standard and cumulative meta-analysis and forest plots to contour-enhanced funnel plots and nonparametric analysis of publication bias. In their articles, the authors present conceptual overviews of the techniques, thorough explanations, and detailed descriptions and syntax of new commands. They also provide examples using real-world data. In short, this collection is a complete introduction and reference for performing meta-analyses in Stata.